Scientists are trying to perfect a technique for growing crops in space so that astronauts have enough food to get to Mars and back. The study was conducted in a climate-regulated growth chamber in the Netherlands. (Inside Science) -- Scientists in Norway and the Netherlands may have brought us closer to workable space farms, which experts agree are necessary if astronauts are ever going to reach the red planet. "Astronauts stay on the International Space Station for six months and they can bring everything they need in either freeze-dried or vacuum packs, but the next goal for all space agencies is to reach Mars where travel is much longer," explained Silje Wolff, a plant physiologist at the Centre for Interdisciplinary Research in Space in Trondheim, Norway. In the best possible conditions, it would take a spacecraft between six and nine months to reach Mars and the same to get back -- not to mention the additional months they would likely spend there. "It's very challenging, if not impossible, for them to take everything they would need for such a long mission," she said. Growing plants in space is tough -- low gravity means water distribution is difficult to manage, the roots are often starved of oxygen, and stagnant air reduces evaporation and increases the leaf temperature. But in a recent study, published in the journal Life, Wolff conducted a sequence of trial-and-error tests to perfect the process of growing lettuce, data which the researchers plan to use to grow salad in space. What Should Astronauts Eat On The Way To Mars? By creating highly precise and optimal growing conditions, Wolff and her colleagues hope to offset the biological stress plants experience in space. The next step is to try out the experiments on the International Space Station. "We grew the plants and germinated them and then we transferred them to different nutrient treatments and recorded data on everything going into and coming out of the leaf," said Wolff. 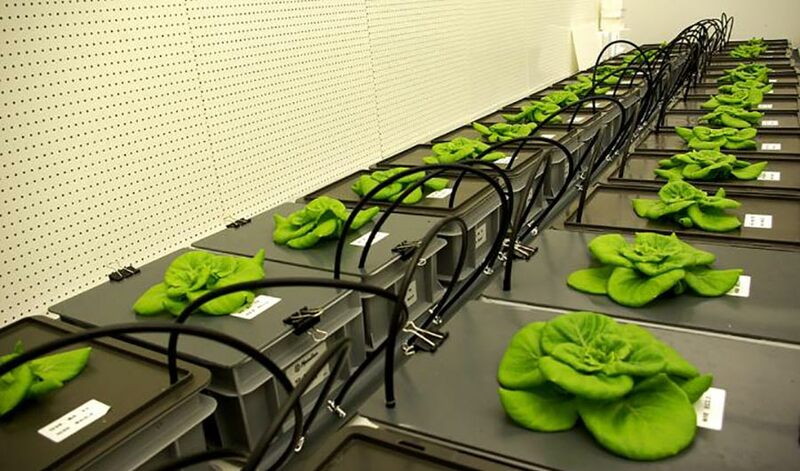 The European Space Agency considers lettuce a strong candidate for space agriculture because it grows quickly, which also makes it ideal for research purposes. "It's not the most nutritious plant so now we're working with beans with higher protein and nutritional value," said Wolff. "We foresee a multicrop system to fulfill an astronaut's nutritional requirements." Wolff grew the lettuce in a closed system that replaced soil with a solution containing water and nutrients. Different lettuce plants were exposed to different nutrient concentrations and different overall volumes of the water solvent as well. Other experts agree that such a hydroponic system makes sense for space. "Watering plants in space is really hard because water moves differently because there's no gravity. If you get the water onto soil particles, it'll just creep over the surface," said Simon Gilroy, a botanist at the University of Wisconsin-Madison who researches the effects of gravity on plant growth. He was not involved with the new study. But a hydroponics system in space is not without its challenges. Hydroponic solutions in space wouldn't mix as they do on Earth, because density and weight don't separate cold and warm water in the same way. So as soon as the lettuce roots extract the oxygen from the solution in its immediate vicinity, it would become oxygen-deprived. "The answer would be to bubble air through it, but if you inject air into hydroponics in space it just makes a foam that never goes away," said Gilroy. That's why Wolff and her team propose putting their plants in a centrifuge when they take their experiment to the International Space Station. This will create at least some gravity for the lettuce. "That's the most exciting part of this study," said Howard Levine, chief scientist at NASA's International Space Station Research Office, who was not involved in the study. "This system requires some level of gravity to control where the water is, hence the centrifuge." "They're kind of cheating because they're running the system almost as if it's back on Earth, so it's a pretty clever approach," he said. But while that may work for an experiment in space, it would be tough to equip a spacecraft with a centrifuge big enough to properly feed hungry astronauts. "They're going to use a really small centrifuge on the space station," said Gilroy. "If you want to scale it up, then you're going to have engineering problems." Nevertheless, Levine said that Wolff's experiments in space will be highly valuable for the space farming endeavor. "There'll be some data on partial gravity levels and plants, which is a major gap in our knowledge. It could help us to know what it might be like to grow plants on Mars or the moon." Benjamin Plackett is a science journalist based in London and the Middle East.